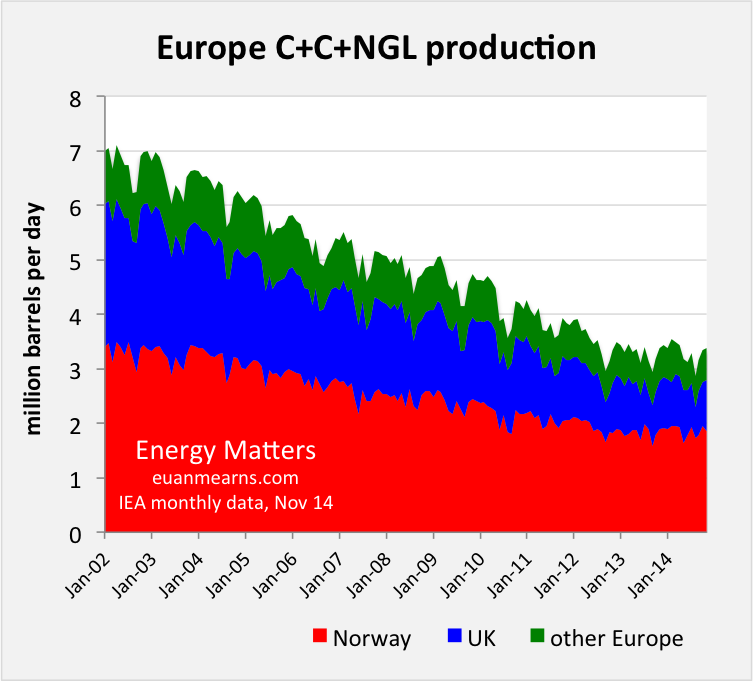 Another ‘guest post’ by Euan Mearns at Energy Matters. I thought that, given developments in oil prices, we can do with some good solid numbers on production. Euan Mearns: This is the first in a monthly series of posts chronicling the action in the global oil market in 12 key charts. 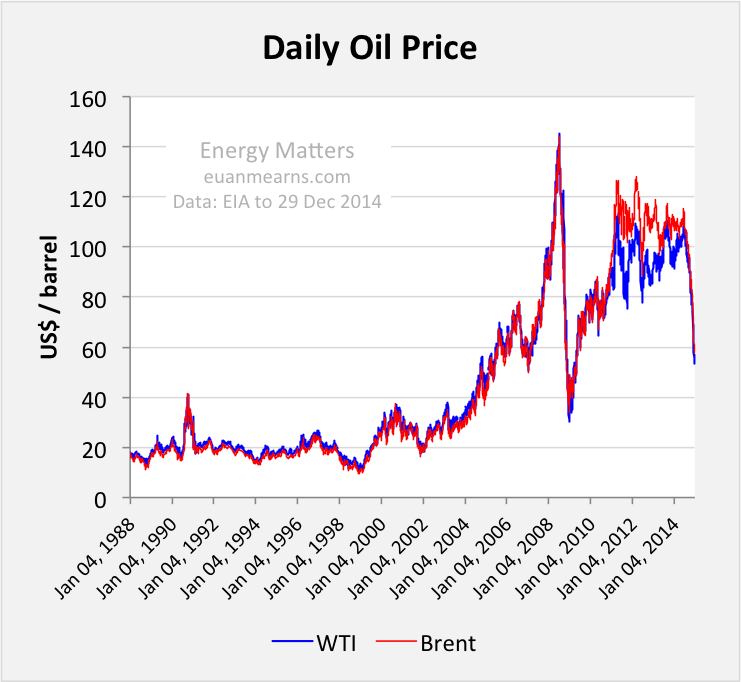 Figure 1 Daily Brent and WTI prices from the EIA, updated to 29 December 2014. The plunge continues at a similar speed to the 2008 crash. The 2008 oil price crash began in early July. It was not until 16th September, about 10 weeks later, that the markets crashed. The recent highs in the oil price were in mid July but it was not until WTI broke through $80 at the end of October that the industry became alert to the impending price crisis. As I write, WTI is trading at $48 and Brent on $51. 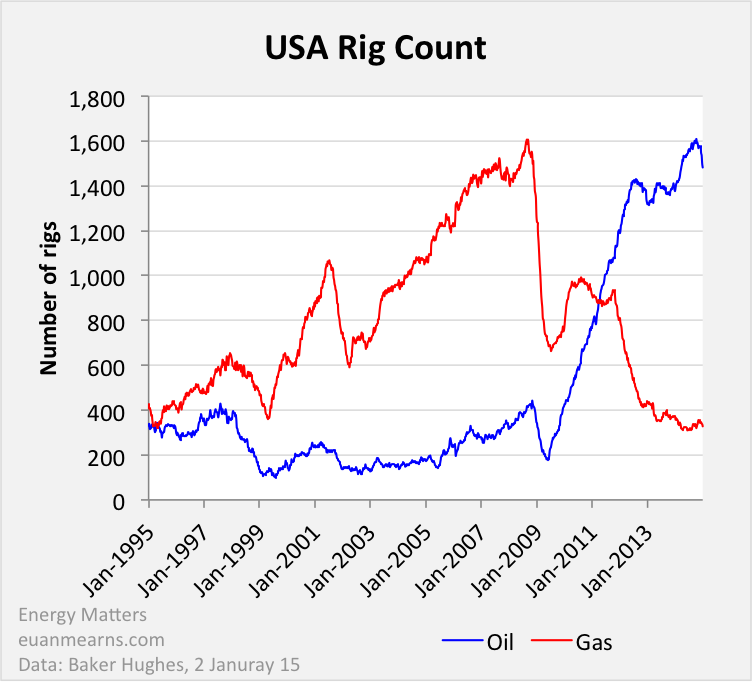 Figure 2 Oil and gas rig count for the USA, data from Baker Hughes up to 2 January 2015. The recent top in operating oil rigs was 1609 rigs on 10 October 2014. On January second the count was down 127 to 1482 units. US oil drilling is clearly heading down and a crash of similar magnitude, if not worse, to that seen in 2008 is to be expected. Gas drilling has not yet been affected with about 340 units operational. Figure 3 US oil production stood as 12.35 Mbpd in November, up 140,000 bpd from October. In September 2008, US production crashed over 1 million bpd to 6.28 Mbpd. That production crash was short lived as shale oil drilling got underway. US oil production has doubled since the September 2008 low. C+C+NGL = crude oil + condensate + natural gas liquids. 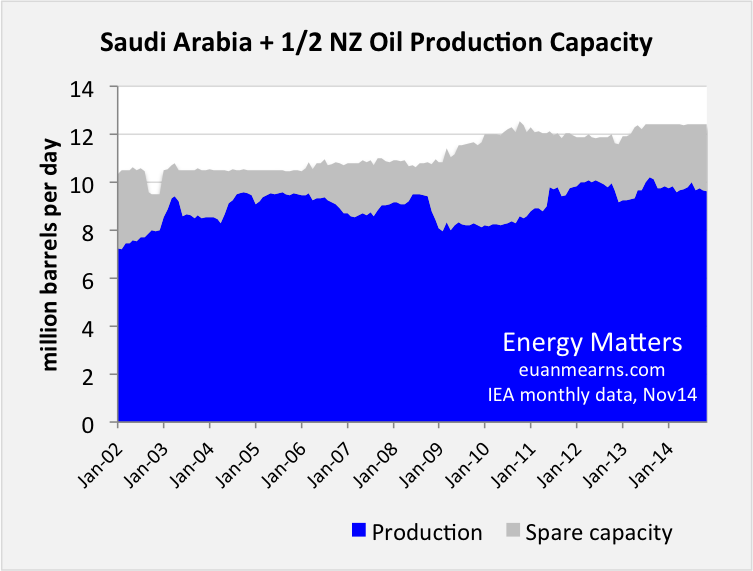 Figure 4 Only Saudi Arabia has significant spare production capacity that stood at 2.79 Mbpd in November 2014 representing 22.5% of total capacity that stands at 12.4 Mbpd. Total OPEC spare capacity was 3.86 Mbd in November, up 250,000 bpd on October. While OPEC spare capacity may be showing signs of turning up, Saudi Arabia is adamant that production will not be cut. 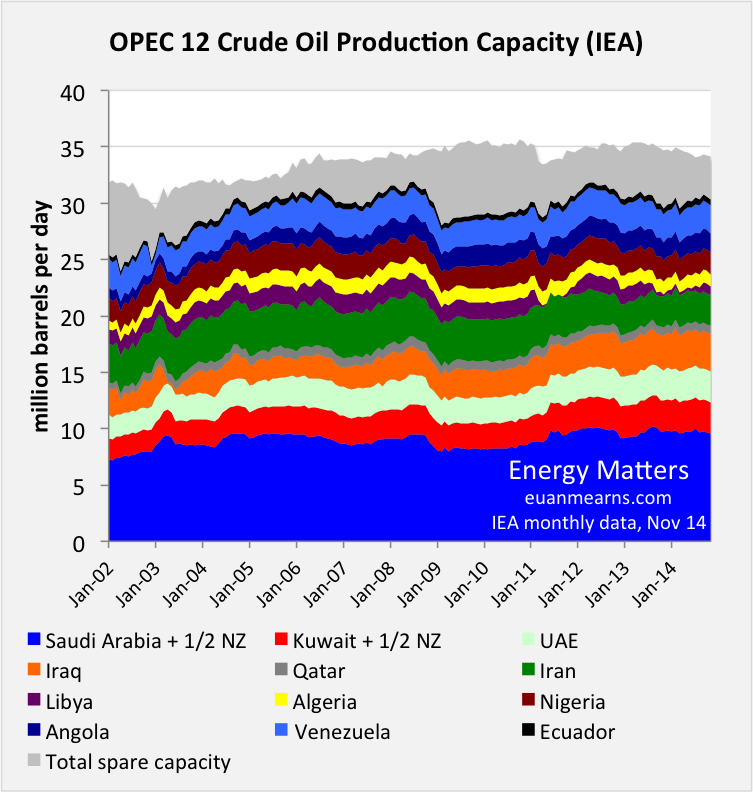 Figure 5 OPEC production plus spare capacity (Figure 4) in grey. The chart conveys what OPEC could produce if all countries pumped flat out and there are signs that OPEC production capacity is descending slowly which casts a different light on the current glut. OPEC countries have skilfully raised and lowered production to compensate for Libya that has come and gone in recent years, and for fluctuations in global supply and demand. But with OPEC production broadly flat for the last three years, all production growth to meet increased demand has come from elsewhere, namely N America. Total OPEC production was 30.32 Mbpd in November down 320,000 bpd from October. Figure 6 Relatively small adjustments to Saudi production has maintained order in the oil markets for many years. It is important to understand that the rapid price recovery in 2009 (Figure 1) came about because Saudi Arabia and other OPEC countries made deep production cuts. Saudi production stood at 9.61 Mbpd in November and total production capacity stood at 12.4 Mbpd. 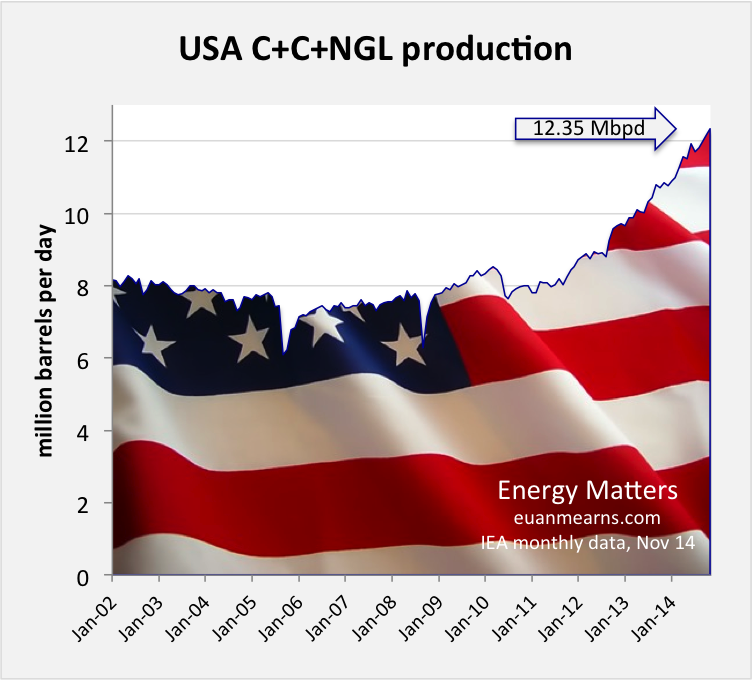 I believe it is significant that US production stood at 12.35 Mbpd. 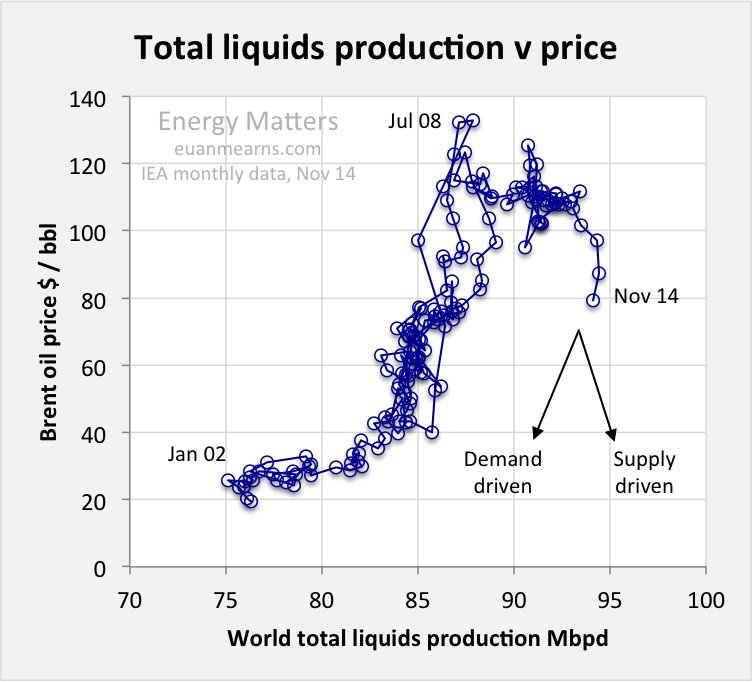 In an excellent post on Monday, Steve Kopits made the point that it was no longer viable for the OECD IEA to call on OPEC to cut production and these numbers illustrate this point . Saudi Arabia already has 2.79 Mbpd withheld. It is clearly no longer acceptable for them to cut production further in order that the USA can produce more. NZ = neutral zone which is neutral territory that lies between Saudi Arabia and Kuwait and shared equally between them. 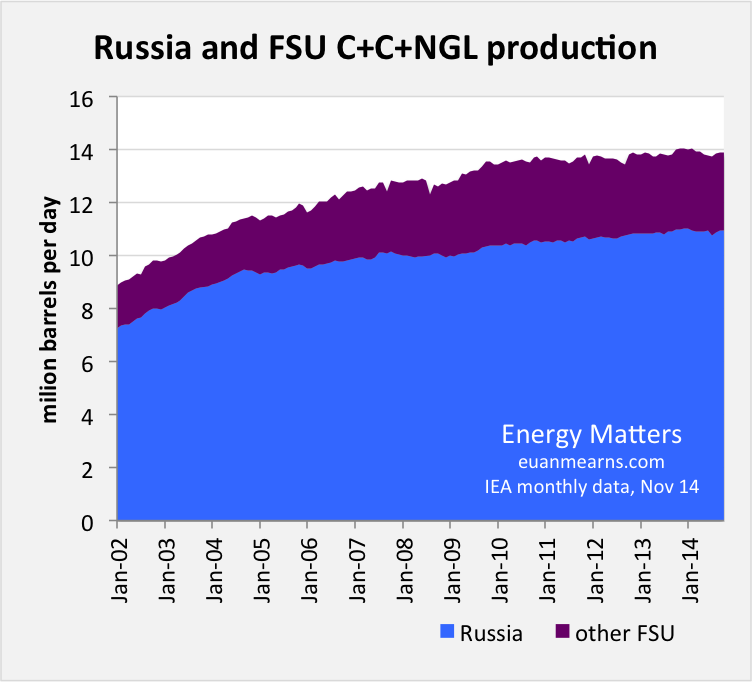 Figure 7 Russia remains one of the World’s largest producers with 10.95 Mbpd in November 2014, more than Saudi Arabia. Together with the FSU, production in this block reached a plateau in 2010 and has since been stable and has not contributed to the turmoil in the oil markets. Figure 8 In 2002, European production touched 7 Mbpd but it has since halved and the region is no longer a significant player on the global production stage. The cycles are caused by annual offshore maintenance schedules where production dips every summer. The decline of the North Sea was probably a significant factor in the oil price run since 2002 as Europe had to dip deeper into global markets. It is also evident that the long term decline has now been arrested on the back of several years with record high oil prices and investment. With several new major projects in the pipeline North Sea production was expected to rise in the years ahead. The current price rout is bound to have an adverse impact. 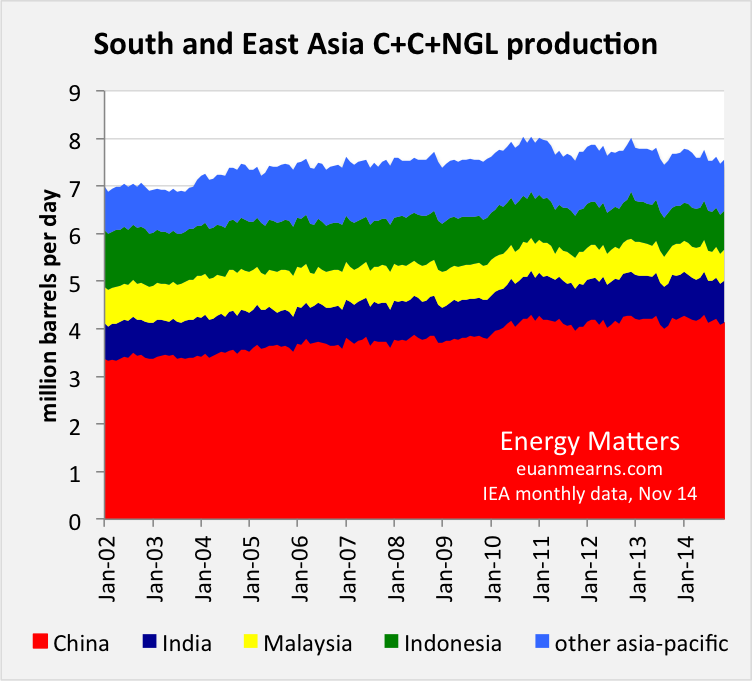 Figure 9 China is a significant though not huge oil producer and has been producing on a plateau since 2010. Production was 4.13 Mbpd in November up 50,000 bpd from October. This group of S and E Asian producers have been declining slowly since 2010. This, combined with rising demand from this region will eventually lead to renewed upwards pressure on the oil price. Figure 10 N American production is dominated by the USA (Figure 3). Canadian production has been flat for a year and Mexican production is in slow decline. 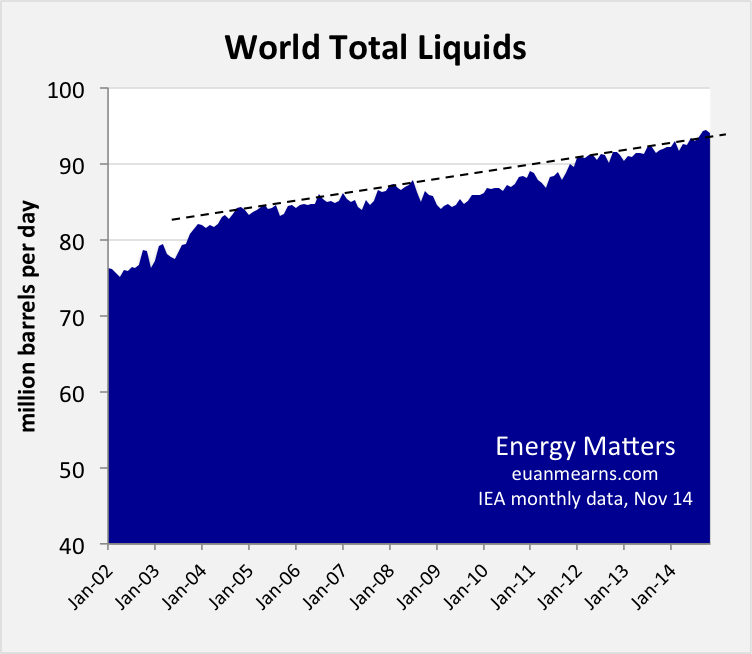 Figure 11 Total liquids = crude oil + condensate + natural gas liquids + refinery gains + biofuel. The chart reveals surprisingly little about the current low price crisis with a barely perceptible blip above the trend line. Most areas of the world have either stable or slowly falling production. The bogey in the pack is the USA that has seen production sky rocket by 4 Mbpd in 4 years. Figure 12 To understand this important chart you need to read my earlier posts [2, 3]. The data are a time series and the pattern describes production capacity, demand and price. There are undoubtedly both supply and demand factors driving the current price rout. The last time this happened, OPEC cut production thereby preserving global production capacity. This time the Saudi plan is to see global production capacity reduced by low oil prices. Getting up to date data on global oil production is frustratingly difficult. While this report is titled “January 2015″, only the rig count data are for this month, the production data is all from November 2014, the most recent available. Owing to budget cuts, the EIA are months behind. Their most recent reports are for September 2014 when WTI was still over $90 / bbl. The EIA are however up to date with daily oil price information reported in Figure 1. The JODI oil production data are more up to date but the global data set is still incomplete. 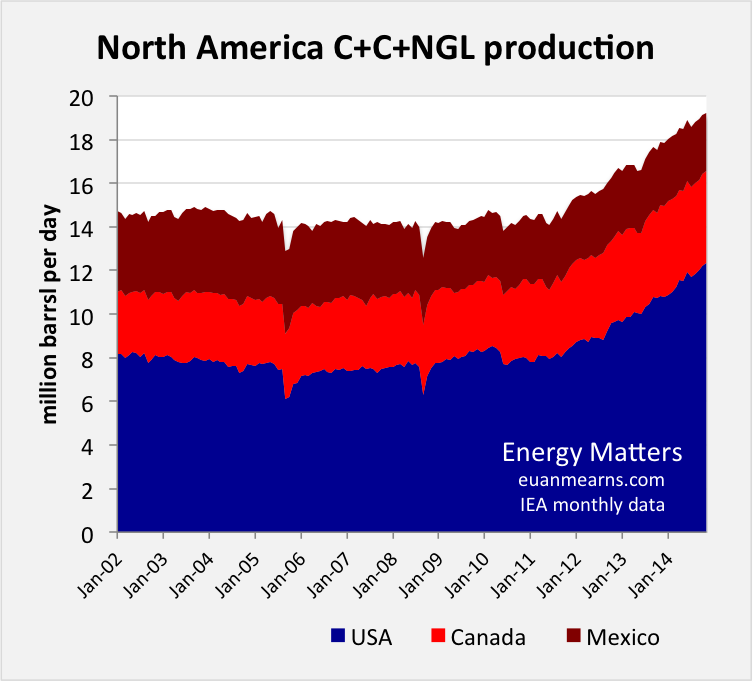 Crude + condensate are reported separately to NGL and overall this source does not yet provide a coherent production time series. The IEA OMR, used here, is I believe the best source. Published monthly, the mid-December report has data for November. However, the most recent months are always revised in subsequent reports. One snag, to get the full report mid-month you have to pay €2,200, and even then I doubt the IEA would be very pleased if I published their data before it became public domain. The data becomes available to all in two weeks, at the beginning of the following month. 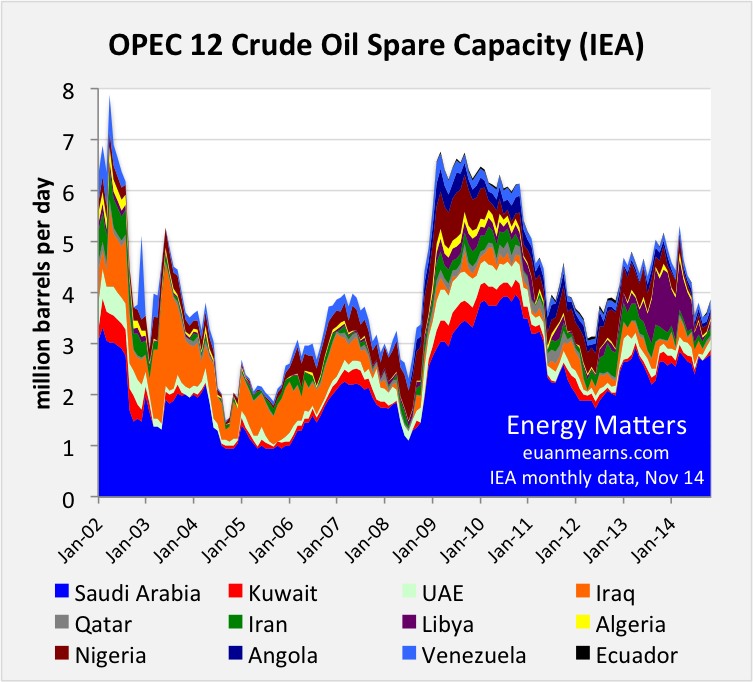 The other benefit from the IEA is they report OPEC spare capacity which I view as an important indicator (Figure 4). The most up to date source of key data is the Baker Hughes rig count which is updated weekly providing a useful indicator for action in the US oil industry (Figure 2).